Every week I deal with broken relationships–marriages on the brink of divorce, life-long friendships deeply frayed, bosses exasperated by their workers, employees dismayed by their employers, community leaders and citizens appalled at one another. While every situation contains unique elements, rarely is a problem that unusual. On occasion, someone just needs an outside perspective or a small piece of new information and they are on their way. But far more often, a fractured relationship doesn’t need more information. In most cases, the people know what needs to happen. They simply need the courage to do it. In many aspects of a relationship, we should rarely go first. Too many marriages or work interactions are hindered by the selfishness of one or both partners. In most situations, we should be the last to leave, be seated, eat, be served, speak, become angry, draw conclusions, make assumptions, judge, etc. But in other circumstances, we need to be the first to do the right thing. We need the courage to act and lead. In many relationships, healing is found after one person displays the boldness to do what needs to be done. 1. Be the first to break the silence. 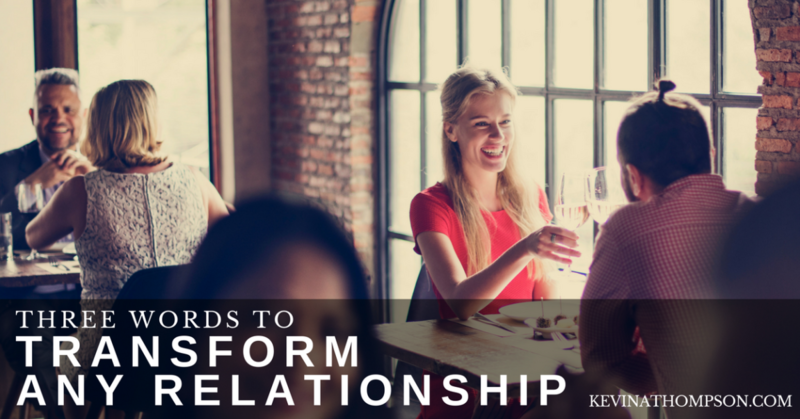 When a relationship is strained, someone has to make the first move toward reconciliation. It’s tempting to run, avoid, and be silent. It’s more fun to talk about people rather than to them. But it’s more productive to break the silence and seek reconciliation. If a relationship is broken, be the first one to make a call, send a text, speak, or take any action which opens the door for reestablishing the relationship. 3. Be the first to forgive. One of my favorite old songs begins with the line, “Everyone needs compassion.” How true those words are. We all stand in need of forgiveness. Because our need to be forgiven is so great, we should be quick to forgive others. This doesn’t mean we ignore offenses or downplay disputes. It does mean we are quick to forgive others because of their faults and to refuse to hold their actions over their heads. The more we understand our own need, the more generous we will be in forgiving others. 4. Be the first to act. Words are plentiful, actions are not. The habit of humanity is to drift toward apathy and inaction. If you want to be different, act. If a situation needs action, be the first to do so. Others will criticize you for doing the wrong thing or acting abruptly, but those are just critics being critics. While they are busy talking, we should be busy acting. Realize it is often better to do an imperfect thing than to wait until the perfect action is known. “I’ll go first” are three of the most important words in the English language. They are the words of leadership. They are as impactful as “I love you” and “I forgive you.” Without these words, families remain estranged, businesses remain ineffective, and communities remain disengaged. But when someone displays the courage to go first, it provides the climate in which others will have to choose whether or not they will act. It doesn’t guarantee change, but it does create the climate in which change can take place. What is one issue within your family where someone needs to go first? Will you? What is an unspoken issue at work where someone needs to break the silence? Will you? What is one conversation you need to have? Will you? “I’ll go first,” are the words of a leader. Go lead. Kevin, What if the person is abusive, do you still take the first step? There are people that are narcissist and do not take the responsibility for any harm they have caused. In such positions, what would you then tell a person to do? I would walk away. I can’t be in a relationship with abusive people. Great article! I struggle with what to do when you have ‘went first’ and the other person doesn’t receive it. Their inability to receive then drives a wedge throughout our close-knit family and ultimately effects everyone as we must make the decision to stay away to avoid drama. Then what? I would try to get outside help. How do you leave a relationship after almost 2 years and things won’t change and he keeps saying we talk about the same things over and over. Depends on if marriage is involved or not. If it’s not, you deal with the reality before you and find the courage to walk away. I am having a very hard time with my break up. We were together for almost two years, but we got into schools in different cities in the east coast…we broke up this summer because of the long distance lack of communication. It has been four months and I have self evaluated, focused on me, realized what was truly wrong in the relationship and see both the faults. But he randomly stops answering and now will ignore me in times of mid convo, if not answer at all. We had an amazing relationship, but simply distance and some little things. I feel as though it can be fixed, but I do not want to push him. It depends on what he wants. Distance is important. It can reveal our feelings. If you want a relationship, tell him. If he doesn’t, move on.